kim watson ★ design ★ papercraft: Washi Tape ideas you are going to love! Washi Tape ideas you are going to love! Hi everyone! 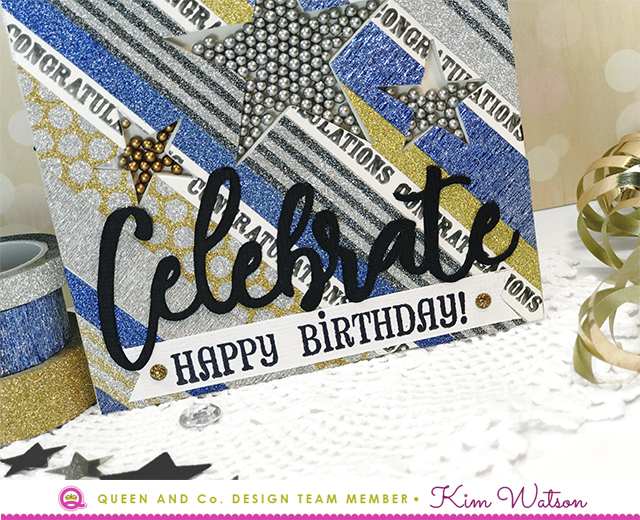 Kim Watson here with my latest Queen & Co projects to share with you. This month the focus is the lush Queen & Co glitter washi tapes & regular washi tapes. I can't wait to show you what I came up with. Having my Father's 70th birthday this week, was cause enough for me to create something especially geared towards a guy. 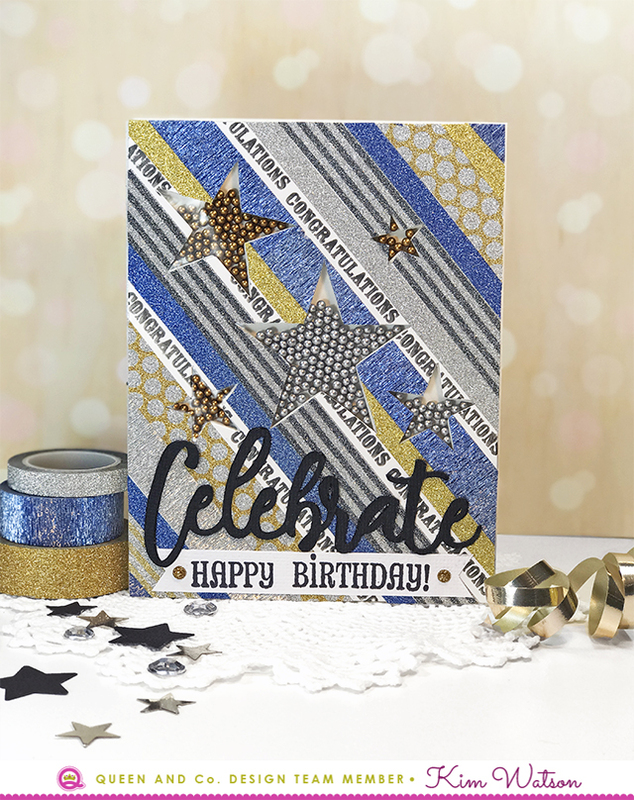 Knowing he wouldn't appreciate pastel colors, I selected the blue, gold & silver glitter tapes to decorate my Star Shaker card kit. Laying the tapes diagonally across the card really makes the most of the stripe effect, I especially love how by leaving gaps at regular intervals between the tapes, allowed me to stamp 'CONGRATULATIONS' sentiments, adding to the interest & texture to the card. Filling the stars was tricky initially because I just couldn't settle on what color would look best to fill the shakers. I decided on the best of both & used both gold and silver, the effect is masculine with a hint of sparkle. Lastly I die cut a title in black cardstock & stamped a happy Birthday sentiment (from Fiskars USA). The extra contrast is what exactly what I needed to finish off the card. Beginning with the Windows Shaker card kit, I filled the different quadrants with Metallic Pearlies & Sequins, then using watercolor paper, created a pretty gradient color wash making sure to match the topping colors in each window. The black cardstock surround with the white windows are the perfect canvas to show off my layered, black, patterned washi tape & sentiment tabs. 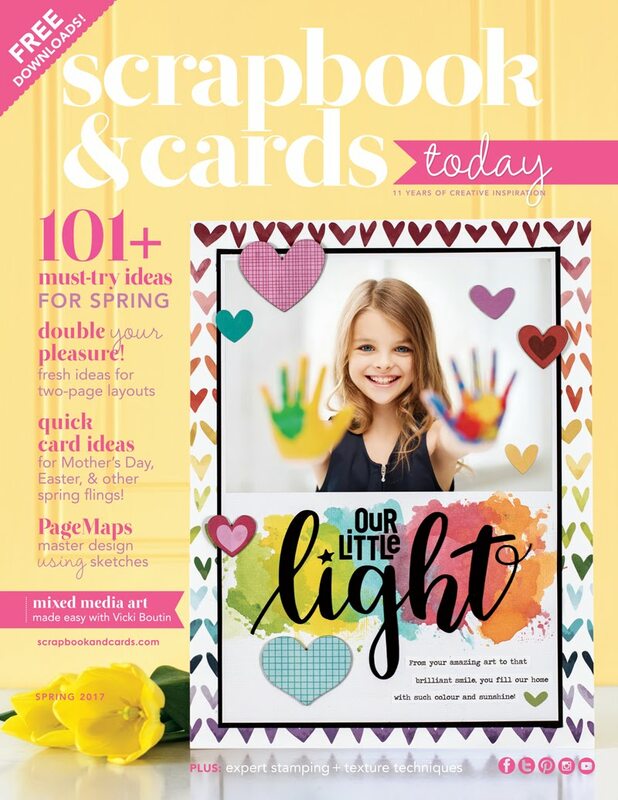 A stamped flower (from Scrapbook & Cards Today magazine) painted in vibrant colors, is the perfect embellishment for such a striking card! This card is a real event...fitting for my brother's up & coming wedding. I started with the white card base, adding a gorgeous floral cut file for some fancy, understated texture. I then collaged strips of glitter washi tape onto a piece of cardstock, making it more manageable to punch out an entire family of gorgeous shimmery butterflies. 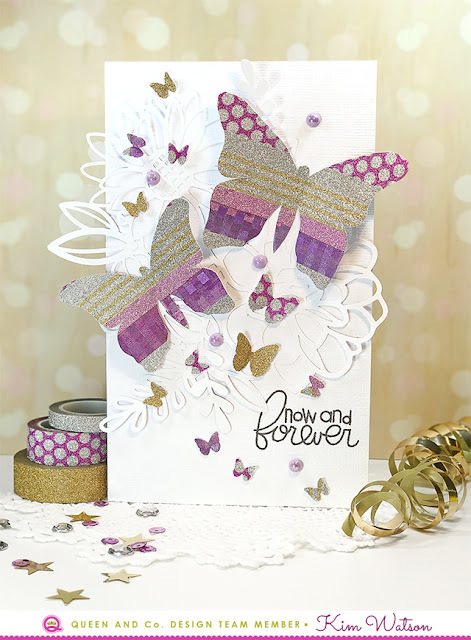 Arranged around the card with lilac, Iridescent Pearls & an appropriate sentiment stamp from Paper Smooches, the effect is breathtakingly glamorous!! Beginning with the Candles Shaker card kit, I filled the candles quadrants with pastel Metallic Pearlies, then using striped washi tape, covered the candles before adhering the card onto the back.The flames were filled with tiny diamonds & covered with silver metallic washi tape making them all sparkly & fun! The front was decorated with Iridescent flowers & Pom flowers and other colorful bling bits. A sweet sentiment stamp from Paper Smooches in the form of a little flag creates a great focal point but it is the turquoise bakers twine adhered around the edge of the card that gives the card the finishing touch. 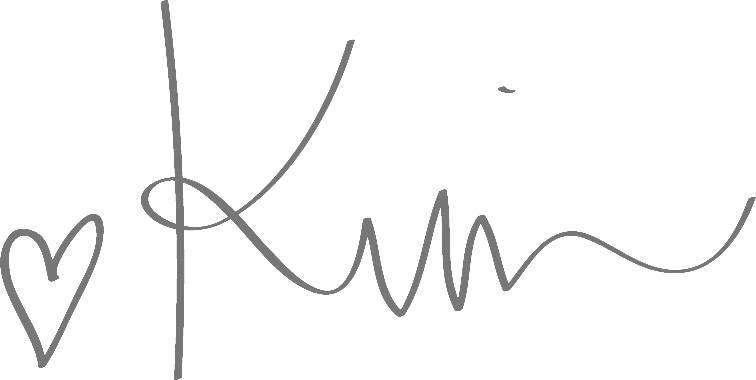 Another month of gorgeous assignments, & I really hope you like them as much as I do. 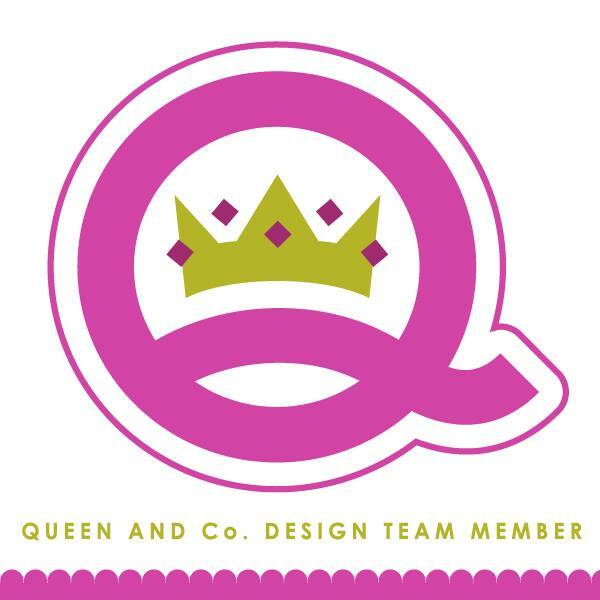 Once again Queen & Co pretties make my job of designing so easy! Be sure to use the linked list below, to grab some of the supplies I used yourself. Have a fun, craft filled day further!